Many people equate evangelical Christianity with conservatism in religion, politics, theology and social attitudes. Some are scandalized by any separation between them. As one evangelical pastor's wife declared to a church group "We are a conservative people!" In fact, however, evangelicals have not always been conservative; radical stances on doctrines, worship, social norms, politics and church leadership have often marked evangelicalism in the past. The 2007 movie Amazing Grace about William Wilberforce's protracted battle against the slave trade featured a small group of British evangelicals committed to abolition. The same radicalism characterized much of American evangelicalism in the years before the Civil War. In recent years the American media have portrayed the evangelical movement as a conservative force in society sometimes equating it with fundamentalism and puritanism. The missing piece of the story is, however, that both fundamentalism and puritanism contained radical elements that opposed the status quo. 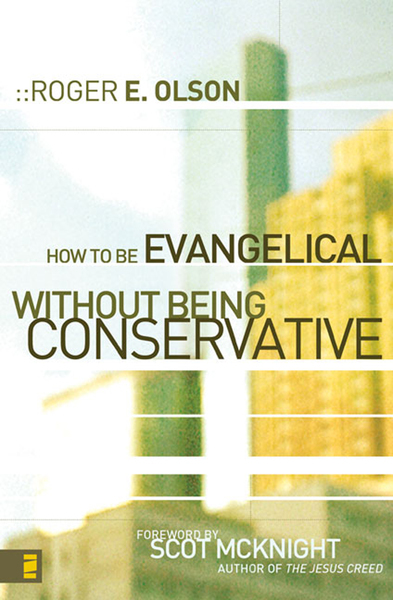 This book sets forth evidence that the link between evangelicalism and conservatism has not always been as strong as it is today in the popular mind and it will provide suggestions for contemporary evangelicals who want to remain evangelical (and not become "post-evangelical") without identifying with conservatism in every way.